The Object 268 is a Soviet tier 10 tank destroyer. The final advancement of its tank destroyer line, the Object 268 features good mobility, effective camouflage, and very well-sloped frontal armor which makes it tricky to attack from the front. Its most notable feature, however, is its upgraded 152mm cannon, which boasts extreme penetration, high alpha damage, a decent rate of rate, and, unlike the BL-10 before it, is very accurate. The Object 268 has worse gun depression than its predecessor, making it a bit more hard to use effectively. However, when mastered, the Object 268 can be a very potent tier 10 TD. The Object 268 marks the end of its Soviet tank destroyer line. This beast has an astounding 303mm of standard AP penetration, making it one of the highest penetrating guns, excluding end tier artillery vehicles and the FV215b (183) or FV4005 Stage II. It also has quite a high rate of fire for the damage it can do, giving it one of the highest DPM of all tier X tank destroyers. Another noticeable feature of this tank is the extreme accuracy of the gun; and while 268's firepower is devastating, this TD is not without its flaws. First off, while it is accurate, it follows suit of its predecessors with a long aim time, as well as having worse gun depression than the Object 704; use that 0.33 accuracy effectively is not easy. Map knowledge is very important with this tank but thankfully the 268 is very mobile, so it can get into positions early and achieve some early shots. It is recommended to use Vents and GLD to make the gun handling and gun stats as effective as possible. Optics is also a viable option to achieve higher view range. If your crew is not as skilled however, then Binoculars are an okay choice as well. In the days of the Second World War, heavy self propelled guns played an important part on the battlefield. It is not surprising that after the end of the war, heavy SPGs, including tank destroyers, remained a priority for designers from all nations. It's surprising that only a handful of these vehicles were ever built in metal, and none were mass produced. The Soviet Union and its Object 268 was no exception. As with heavy tanks, prospective Soviet heavy SPGs were well protected vehicles with long 152 mm guns. The first requirements for these vehicles were ready in 1945, but work began only a year later. They were designed on the chassis of the Object 260 (IS-7) and Object 701 (IS-4) tanks. The SPG on the IS-4 chassis, indexed Object 715, was meant to use the 152 mm M31 gun developed by factory #172, with identical ballistics to the 152 mm high power Br-2 gun. The same gun was planned fro the Kirov factory's SPG. It is unclear what it was called. Some sources say Object 261, others say Object 263. Later, factory #172's design bureau designed an even more powerful gun, indexed M48. The design was similar to the M31 and even had a similar muzzle brake, but the muzzle velocity was increased to 1000 m/s. Such a powerful weapon could destroy any enemy tank or pillbox without a problem. 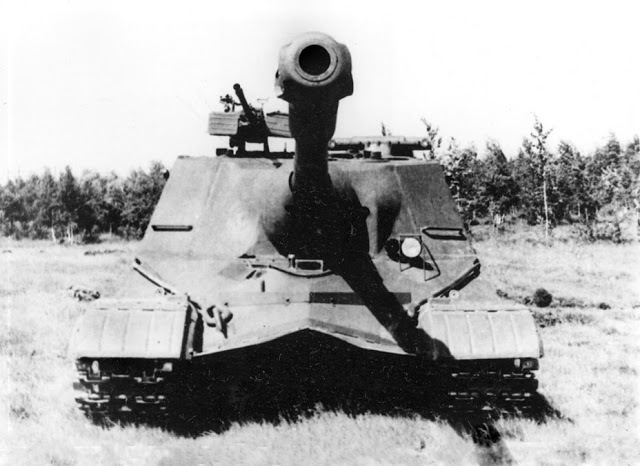 The semi-open casemate Object 262 SPG was planned with the same gun. The main obstacle for these plans was the delays of the IS-7 project and problems with mass production of the IS-4. The last activity on these projects happened in 1947, after which they were put on hold until better days, but those days never came. 152 mm M48 gun installed in a heavy SPG. It is unclear at this moment which vehicle is pictures here. On February 18th, 1949, decree #701-270ss was issued by the Council of Ministers of the USSR, which cancelled development and production of all heavy tanks that weighed more than 50 tons. Along with the IS-4 and IS-7, SPGs on their chassis ceased to exist. The same decree ordered ChKZ's SKB-2 and the experimental factory #100 in Chelyabinsk to design a heavy tank weighing less than 50 tons. 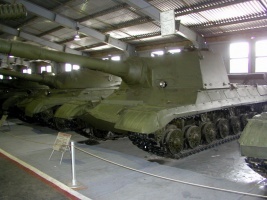 This project, designated Object 730, resulted in the IS-5 heavy tank. The draft was presented in April of 1949, and ChKZ finished assembly of a prototype by September 14th. 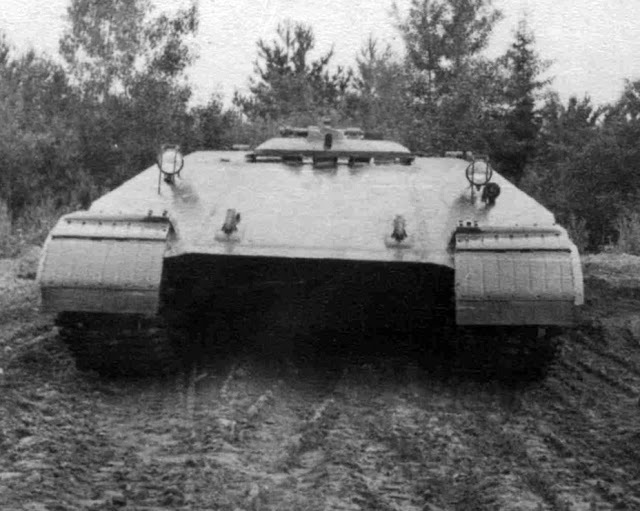 It was logical to develop an SPG on the same chassis, but the designers were in no hurry. They still remembered what happened with the IS-4 and IS-7. Work only began when it was clear that the Object 730 was a success and its acceptance into service was not far off. 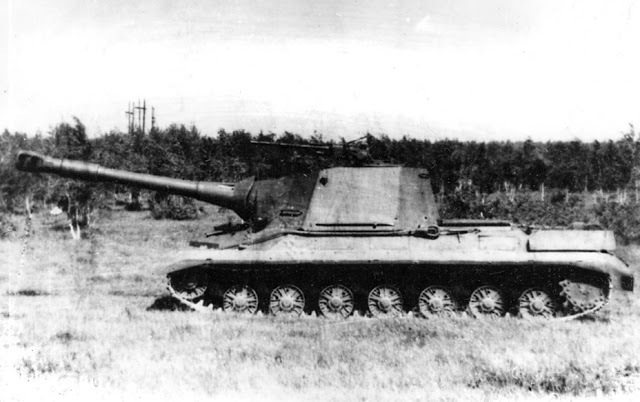 Object 116 (SU-152P) on trials. Its 152 mm M53 gun was used by the Kirov factory design bureau for the new SPG. Literature dedicated to the T-10 and vehicles on its chassis usually puts the start of work on the SPG on July 2nd, 1952, but the real sequence of events is different. SPGs are usually designed with a very specific artillery system in mind. 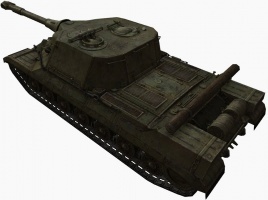 However, the gun that eventually appeared on the Object 268 did not show up in the project until 1.5 years later. However, work on the gun began a lot earlier. From this point of view, work on the new heavy SPG began in 1946, when factory #172's design bureau began work on the 152 mm M53 gun in parallel with the M31 and M48. 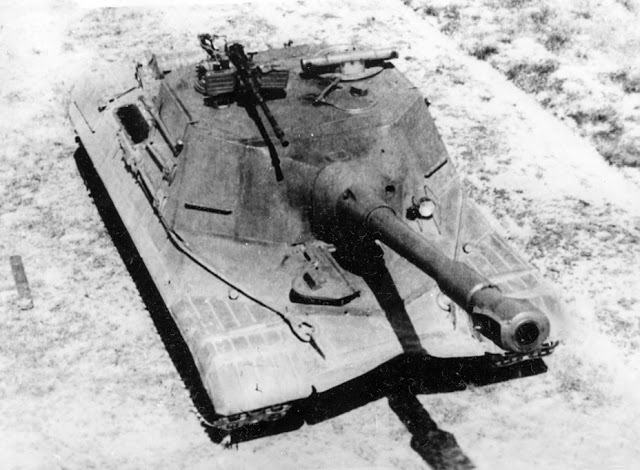 This gun with the muzzle velocity of 760 m/s was meant for the Object 116, also known as SU-152P. The gun and the SPG were built in 1948. Trials showed unsatisfactory precision, and the project was shelved. Today, the SU-152P can be seen in Patriot Park. This artillery system, in a slightly altered state, was proposed for the prospective SPG. 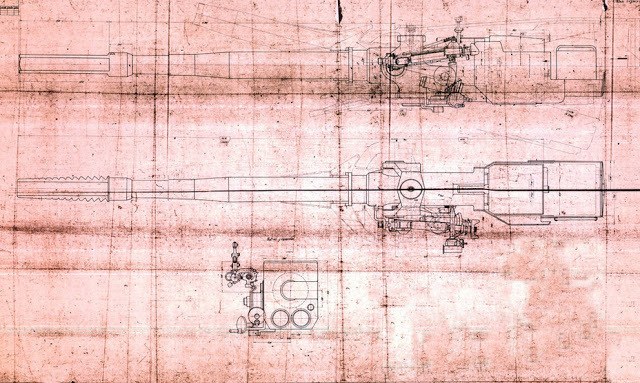 Draft of the M53 gun modified for installation in a heavy SPG, 1952. Work on the new vehicle, initially without any kind of designation, was initially headed by P.P. Isakov. The work was being done by the Special Technological Design Bureau (OKTB) of the Kirov factory in Leningrad. 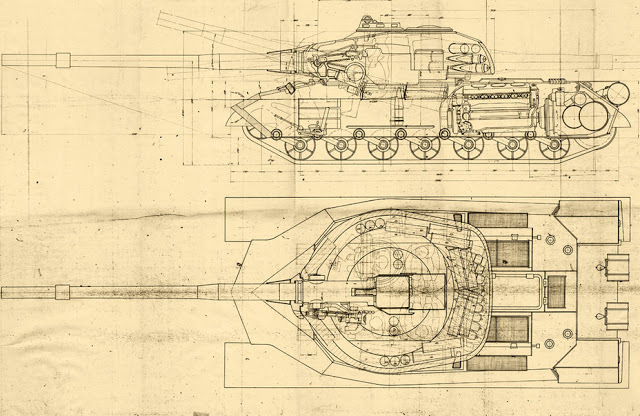 Three variants of the vehicle were developed, two of which were drastically different from the Object 268 that is widely known today. The fact that the design work began before July of 1952 is confirmed by the dates on the drafts of the 2nd and 3rd variants: April 25th, 1952. By that time, the main parameters of the vehicle were already known. One of the requirements was the mass: the new SPG had to weigh less than 50 tons. SPG on the Object 730 chassis. This wasn't the first Soviet heavy SPG with a rear fighting compartment - the first was designed by N.F. Shashmurin back in 1944. Variant #2 of the new SPG had a rear fighting compartment, which allowed the reduction of the hull length of 6675 mm. Since the entire from of the vehicle was taken by the engine and transmission, the driver sat in the fighting compartment, to the right. The driver's visibility with this layout was not great. These inconveniences were balanced out by the relatively short overhang of the barrel, only 2300 mm. The front of the casemate was 150-180 mm thick, the sides were 90 mm thick. The upper front plate was only 75 mm thick, but sloped at 75 degrees. The vehicle was well protected. The crew consisted of four men. In order to ease the loader's job, shells were stored in a loading drum behind the gun. Variant #3 with the gun in a rotating turret, April 1952. The third variant was no less original. This was more of a tank than an SPG, but its armour had to be thinned out due to its heavy and powerful gun. 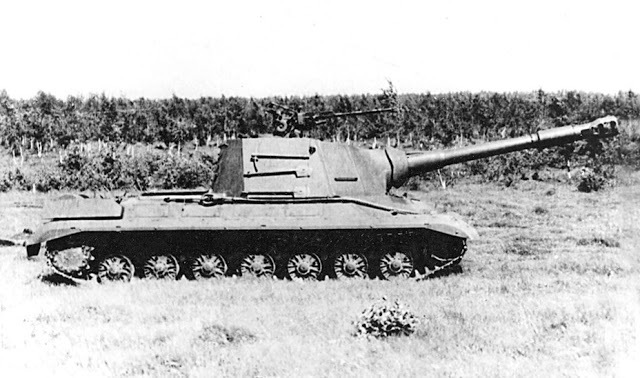 There was a significant difference between the Object 730 and SU-152 (as it was called in documentation). The turret had to be designed from scratch, and the turret ring increased from 2100 mm in diameter to 2300 mm in order to accommodate the 152 mm gun. The maximum thickness of the turret armour was 200 mm. The ammunition capacity remained at 30 rounds. Most of the ammunition was placed in the turret bustle, which would ease the loader's job. The new turret made changes to the hull also necessary. The length of the hull increased by 150 mm. The thickness of the upper sides was reduced to 90 mm, and the lower sides to 50 mm. This was done to keep the mass within the 50 ton limit. The upper front plate and rear were reduced to 60 mm and 40 mm respectively. The SPG had no coaxial gun, but it did have a KPV high caliber AA machinegun. By the summer of 1952, the SPG on the Object 730 chassis project already took its shape. The decree issued by the Council of Ministers on July 2nd approved an already existing project and made some changes to work that was already underway. Around this time, the index "268" appeared on blueprints, and the SPG was named Object 268. Literature describes five variants of the Object 268, but that is not exactly correct. 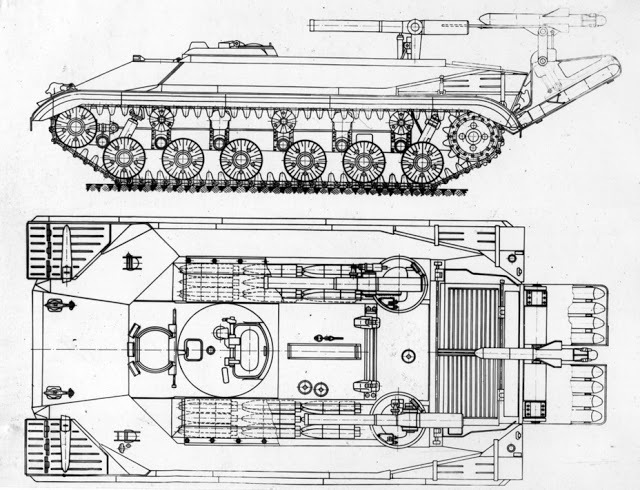 The two aforementioned variants were designed before the final draft of the tactical-technical requirements was finished, nor did they carry the 268 index. In reality, there were three variants of the vehicle, two of which were an evolution of previously developed drafts. Both of these variants were ready by December of 1952. The artillery system that was used in these projects was still under development. According to preliminary calculations, the muzzle velocity of its shells would be 740 m/s. The basis for the project was the M53 gun, mixed with some parts from the M62-T 122 mm tank gun. The overall mass of this system with no official name was 5100 kg. Variant #4 had thicker armour and a roomier fighting compartment which housed 5 crew members. The redesigned version of the 2nd variant which was indexed #4 was finished on December 18th, 1952. This design already had the index 268, and the chief designer was listed as Zh.Ya. Kotin himself. Externally, the 4th variant was similar to the 2nd, but the changes were significant. First of all, the length of the hull was increased to 6900 mm, almost the same as on the Object 730. The length of the barrel overhang was reduced by 150 mm. The sloped rear of the casemate was straightened out, which increased the available size. These changes were necessary, as the new technical requirements were for a crew of 5. The new crew member was a second loader, positioned behind the commander. The commander received a new cupola with a rangefinder and a machinegun with a curved barrel. The driver's station was redesigned, and he received new observation devices. The loading drum was left alone, but the project authors noted that the increased fighting compartment size meant that an even more powerful gun could be used. In parallel with the increased fighting compartment size, the armour protection was increased. The lower front plate was thickened to 160 mm. The front of the casemate stayed at 180 mm, but 160 mm thick cheeks were positioned at a sharp angle.The mass of the vehicle remained under 50 tons. On December 10th, 1952, the third variant of the SPG was reworked, earning the index #5. The length of its hull was reduced to the Object 730's length (6925 mm), and the upper sides became curved. The front of the hull also changed somewhat, but its thickness remained the same. The decreased length of the hull was achieved by using the V-12-6 engine, which later migrated to the T-10M. The increased turret ring diameter also made its way over. The 4 man turret was also redesigned. The commander received a rangefinder, but the curved barrel machinegun was given to the loader. Both reworked projects inherited the KPV AA machinegun. Variant #5 differed from variant #3 by a series of small changes and a 5 man crew. Neither of these variants made it past the draft stage. In January of 1953, they were presented to the GBTU Scientific-Technical Committee and Ministry of Transport and Heavy Machinebuilding. After studying them, member of the committee decided that both projects require substantial changes to the hull and cannot be accepted. The commission approved another, much more reasonable project, which required minimal changes to the chassis. The biggest change was the installation of the more compact V-12-6 engine, which was also used in variant #5. The redesigned version of the project was presented in June of 1953. The commission was also shown a 1:10 scale model. On August 25th, the Object 268 was approved by Colonel-General A.I. Radzievskiy. Several sources say that this was the end of the design work, but that was not so. Of course, the acceptance of the Object 730 into service on November 28th, 1953 had an effect on the development, but work continued. N.M. Chisytakov was assigned as the lead engineer on the project, previously working in Nizhniy Tagil as a head of new projects. Work on the Object 140 began under his supervision, but for a number of reasons the engineer left Nizhniy Tagil and moved to Leningrad. The overall management of the project fell to N.V. Kurin, a veteran of the Kirov factory and the author of many SPG designs. 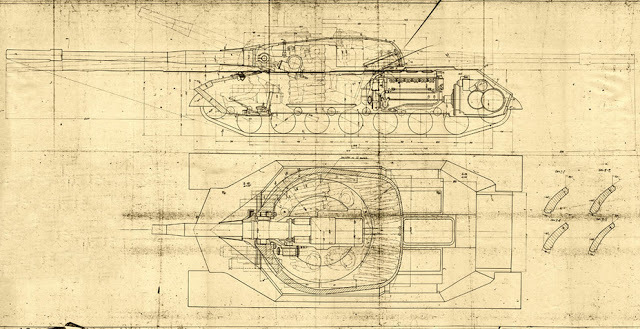 Draft of the final version of the Object 268, June 1954. There was another reason that development of the Object 268 dragged on that is not accounted for by some researchers. The gun that would be installed on the SPG was still being designed. Meanwhile, the factory #172 staff did not sit still. After their M62 122 mm gun which was used on the Object 752 and Object 777 tanks, the designers from Perm started working on 152 mm guns in early 1954. Seven years passed since the design of the M53, a modified version of which was going to go into the Object 268, and artillery did not sit still. 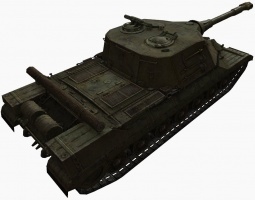 A new 152 mm gun, indexed M64, became available. Its muzzle velocity was almost the same as on the M53 (750 m/s), but the length of the barrel was much shorter. Since the fighting compartment of the T-10 and Object 268 were positioned in roughly the same place, this was very important. To compare, the modified M53 had an overall length from the center of the casemate to the tip of the muzzle brake of 5845 mm, while the M64's length was 4203 mm. The overhang of this new gun was only 2185 mm. This was how the vehicle was built in metal. Spring-summer 1957. Officially, the technical project of the M64 was only inspected by the GAU in August of 1954, but the OKTB received information about this new gun much earlier. The aforementioned thesis that work on the Object 268 ended in the fall of 1953 seems strange when there are blueprints dated late June, 1954. 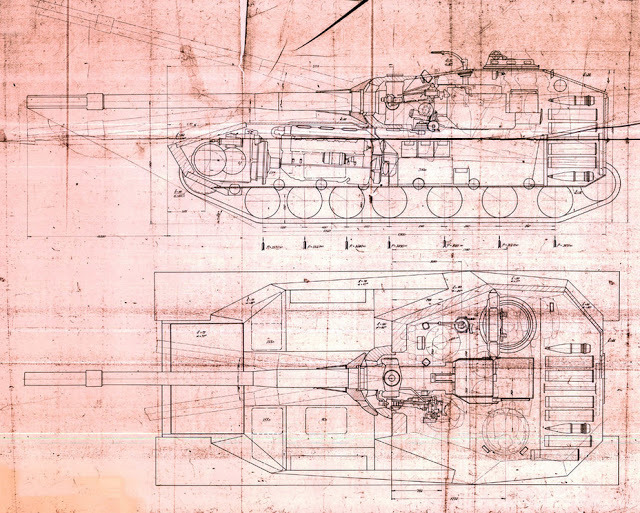 The blueprints (overall, there were 37 pages of documentation) showed a vehicle that was very similar to the Object 268 that was later built. In concept, the vehicle was reminiscent of the German Jagdtiger, which was made as similar as possible to the Tiger B. There was a significant difference in that Soviet engineers managed to keep the dimensions of the T-10's hull and its mass. The Object 268 was also slightly lower than the T-10. The design inherited a commander's cupola with a rangefinder. As with the predecessors, the thickness of the sides and rear of the hull had to be reduced, but the sides of the casemate grew to 100 mm. The protection of the casemate from the front was also very impressive: 187 mm. The casemate was widened to the dimensions of the hull and was quite roomy. 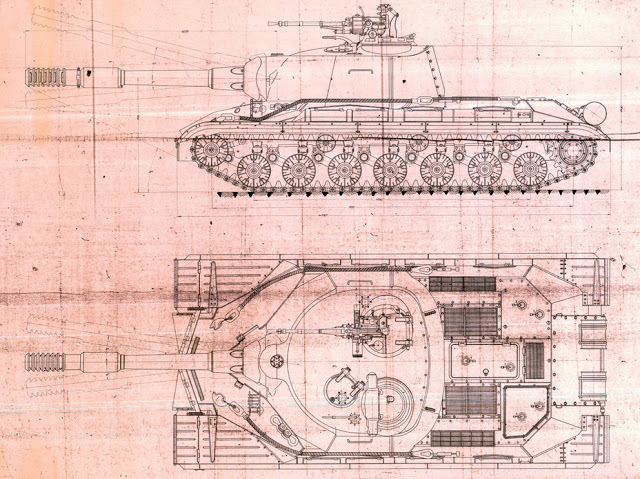 Plans for the Object 268 were finalized in March of 1955. The due dates for prototypes were also set then. According to plans, the first prototype was due in the first quarter of 1956, and two more would be build before the 4th quarter. Sadly, work on new generation heavy tanks began around this time. Chisytakov became the head of the Object 278 project, which had a direct impact on the development of the new SPG. As for factory #172, the new 152 mm M64 was completed in December of 1955. In February of 1956, after a series of factory trials, the gun with serial number 4 was sent to Leningrad, to the Kirov factory. The vehicle looked very impressive from the front. Surprisingly, it was even lower than the ISU-152. These delays meant that the first Object 268 was only ready by the fall of 1956. Overall, the vehicle was done to the project documentation, but there were some changes. For example, the curved roof was deleted. Instead, the SPG received a much simpler roof. The machinegun with a curved barrel was also removed, the prototype had its port welded over. The rear of the casemate was also straightened out. This part was also made removable to facilitate installation and removal of the gun. The crew remained the same, at 5 men. Thanks to the good layout, it was not cramped inside at all, and even a very tall person could work in the SPG. The ammunition capacity of this high caliber gun was 35 rounds. The crew's comfort was also improved by features of the gun. For one, it had a fume extractor, which reduced the amount of gases that ended up in the fighting compartment. The gun also had a loading mechanism, which made the loaders' jobs easier. Object 268 from the right. Factory trials began in the fall of 1956, and were completed in the spring of 1957. Overall, the characteristics of the new vehicle were close to calculated ones. The mobility of the Object 268 was similar to that of the T-10, including its top speed. After these trials, the SPG was sent to Kubinka. Gunnery trials showed that the delays weren't for nothing. The precision of the gun was superior to that of the ML-20S on the ISU-152. The gun was also superior in muzzle velocity, range, and rate of fire. Alas, none of that mattered. The order for two more prototypes was cancelled and the first prototype was sent to the NIIBT proving grounds museum. Currently, the SPG can be seen in Patriot Park. Recently, the museum staff restored the SPG to working order. From this angle, you can see that the roof differs from the draft blueprints. If the Object 268 had come around five years earlier, it would have had a very high chance of being accepted into service. The vehicle was well designed, comfortable for the crew, and well protected. However, by 1957, a whole sequence of events made the mass production of this SPG pointless. To start, a new generation of heavy tanks was in development since 1955 (Objects 277, 278, 279, and 770), which had very thick armour. Even the M64 gun would not be enough against them. GBTU realized that foreign tank designers are also not sitting still. The prospective SPG was armed with a gun that was already obsolete. In addition, a modernization program for ISU-152 vehicles began in the mid-1950s that drastically increased their lifespan. Unlike the Object 268 which had not started production, these SPGs were available here and no. Yes, the ML-20S was inferior in all parameters to the M64, but not enough to justify a new SPG. Finally, the production of the T-10 was ramping up slowly. Loading the Kirov factory and ChTZ with SPGs meant that the already narrow trickle of T-10s would be reduced even further. In addition, factory #172 had yet to master the new gun. There was another reason, largely the same one that caused the British to cancel their FV215 and FV4005 heavy SPGs. By 1956, work on anti-tank guided missiles had already begun. On May 8th, 1957, the Council of Ministers of the USSR approved work on tanks and SPGs armed with guided missiles. Many people mention "bad Khrushchev", but let's face the truth. An ATGM launcher is much more compact than a gun. Launching a missile is simpler, and it can be controlled in flight. With a similar payload, a missile is more effective. It is not surprising that the Object 268 was the last Soviet heavy assault gun. 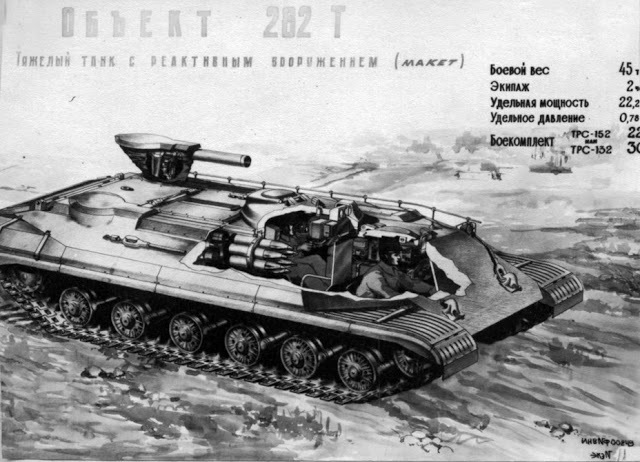 Draft of a missile tank destroyer, Object 282T, 1958. At the same time, work on SPGs on the T-10 chassis did not stop. In 1957, the Kirov factory OKTB began work on a vehicle that was indexed Object 282. It is often called a tank, but in practice, it was a heavy tank destroyer. It was created to be used with 170 mm "Salamandra" anti-tank missiles, but when NII-48 did not manage to complete them, the armament was changed. The final configuration, the Object 282T, could be armed with 152 mm TRS-152 missiles (ammunition capacity of 22) or TRS-132 missiles (ammunition capacity of 30). Object 282T at trials, 1959. The vehicle that was sent to trials in 1959 differed drastically from its predecessors. 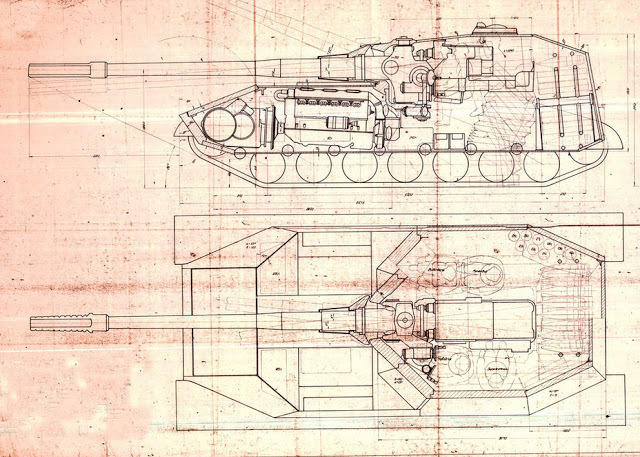 Despite its impressive ammunition capacity and a 2-3 man crew, the tank was shorter than the T-10. More importantly, its height was only 2100 mm. The front of the tank was redesigned. In addition, the designers moved the fuel tanks forward, separating them from the crew with a 30 mm bulkhead. The tank received a V-12-7 1000 hp engine. Its maximum speed increased to 55 kph. The result was an unusual vehicle, which was killed by its armament. 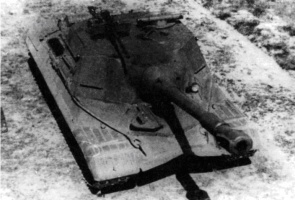 Trials showed that the Object 282T's Topol control system did not work reliably enough, and the project was cancelled. 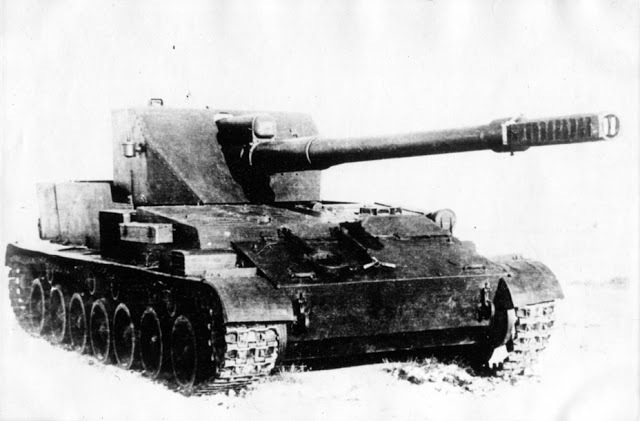 The reworked variant, Object 282K, would have looked like this, but it was never built in metal. In 1959, the Kirov factory OKTB designed an improved vehicle indexed Object 282K. Its mass increased to 46.5 tons, and its height decreased to 1900 mm. The vehicle was equipped with two TRS-132 launchers (20 missiles each), one per side. The rear housed a 152 mm PURS-2 missile launcher with 9 missiles. The fire control system was taken entirely from the Object 282T. Due to poor results with the Object 282T, the Object 282K remained on paper. This was the end of SPGs on the T-10 chassis. This page was last modified on 28 June 2018, at 01:17. This page has been accessed 469,328 times.